« How Big Could ApplePay Be? 2015 The Year of ApplePay? The media is full of worry — will “patient” be kept or removed from their next statement? When will they begin raising the Fed Funds Rate? They worry that when the Federal Reserve begins to raise the Federal Funds Rate (the rate banks charge each other on a very short-term basis to loan each other their excess reserves), that the stock market will go into a tail spin. It is true that there are some worried “players”, and they will most probably cause the stock market to experience a transient dip (maybe a correction of up to 10%), but history says their concerns are unwarranted. Admittedly, there has never been a time when rates have been so low or for so long, and maybe the addiction to low rates will make the negative reaction to a rate move toward a more normal (or “un-suppressed”) market more severe. But in the end, rising interest rates within “normal” ranges DO NOT cause stocks to go down. As we have shown before, when short-term rates exceed longer term rates (an “inverted yield curve”) bad tidings are with us, but the Fed is not talking about that. They are talking about raising the Fed Funds Rate from a 0% to 0.25% rate to an incrementally higher level, and maybe several increments over a series of periods, but not about raising them above longer-term rates. 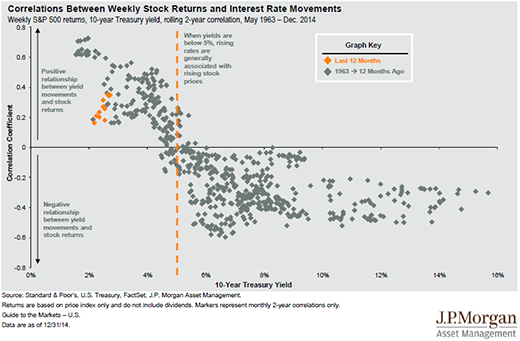 Consider first, the relationship between 10-year Treasury yields and the performance of the S&P 500, as shown in this chart from JP Morgan Asset Management. This chart shows the Treasury yield on the horizontal axis and the correlation of S&P 500 stock prices to the Treasury yield from 1963 through the current time. It shows that stock prices RISE with rising interest rates over a 2 year rolling period up until the 10-year Treasury reaches about 5%. It is currently around 2%. Rates rise because business is improving, and that means profits are improving and stocks like that. Now to the Fed Funds question (and information on 2-year Treasury rates and 10-year Treasury rates). 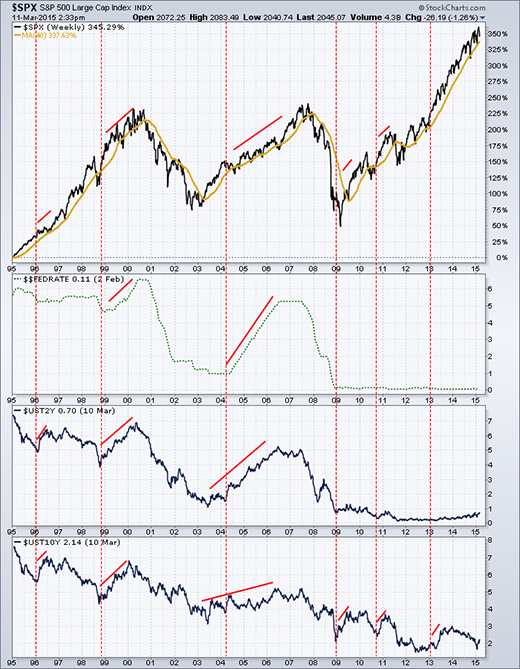 This 20-year weekly chart (1995 through current 2015) shows the S&P 500 in the top panel, the Fed Funds Rate in the next panel, followed by the 2-year Treasury rate and the 10-year Treasury rate in the bottom 2 panels. The takeaway is shown by the slanted red lines drawn on each panel. It shows that as a generality, most of the time when those three rates are rising, the S&P 500 was able to rise as well. We went back further and looked at 1980 – 1994, and found the same general relationships. 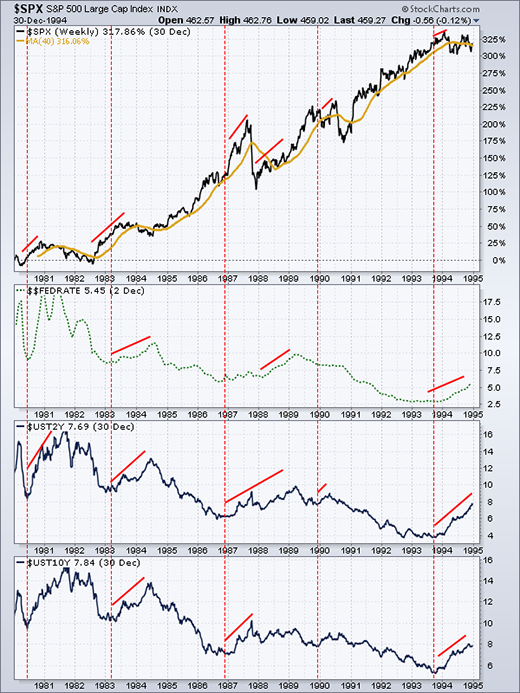 There are things to worry about, and other things to move stocks down, but over a reasonable holding period, rising interest rates from low levels does not appear to be of great concern. In fact, a knee jerk down spike in stock prices when Fed begins raising rates, may turn out to be a good buying opportunity, rather than time to run away and hide in cash. This entry was posted on Thursday, March 12th, 2015 at 1:55 PM and is filed under market outlook. You can follow any responses to this entry through the RSS 2.0 feed. Both comments and pings are currently closed.